How to add Social Media Tags to your Branch Links? Social Media Tags, a.k.a. OG tags, are used to display content as a preview card in Facebook, Twitter, Pinterest, and etc. Meta tags present on the web page you use as your $fallback_url or Meta tags present on the corresponding web URL you used to create the short link from the dashboard. What are the different Social Media Tags which can added to a Branch Link? Similarly, here is a list of all the social media tags to handle the social media displays on Twitter. These OG values can also be edited from the Social Media tab at the time of configuring the link. 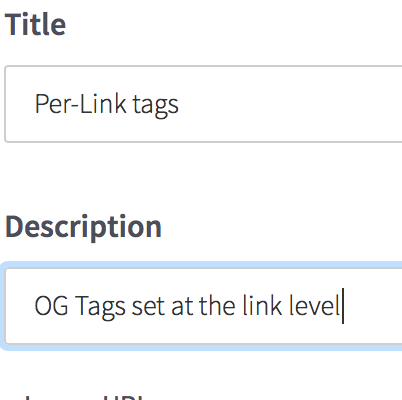 In case of no canonical url, we pull the default OG tags from the fallback_url as defined in the link settings. Social media tags tracked with the canonical URL ($canonical_url) take precedence over the meta tags present with the default URL (i.e $fallback_url) or the Social Media Display Customization settings on the dashboard. "og:video:type=application/x-shockwave-flash" has not been set anywhere on the Branch dashboard or as a link parameter. However, this is added as a meta tag web site, which is also the $fallback_url in the above payload https://dwestgate.github.io/ExampleFallBackURL/. However, if there is a value provided for $og_url with the link data then only the tags for the URL mentioned as $og_url will be scraped. In this situation the link parameters get overridden by the parameters in $og_url, as can be seen by checking the Facebook Sharing Debugger.